Mornin’ buddies! Today we have a fun tutorial for all you buildy-types. But you know I can’t jump into it without sharing a bit of back story to set the scene. My mom grew up on a farm here in Iowa, and my grandmother still lives there (at age 97). So you can imagine there’s nearly 100 years worth of ‘old stuff’ hanging out in the out buildings. Old implement, coffee cans from 1920, barbed wire, rusty tools, and this sweet chippy tailgate. 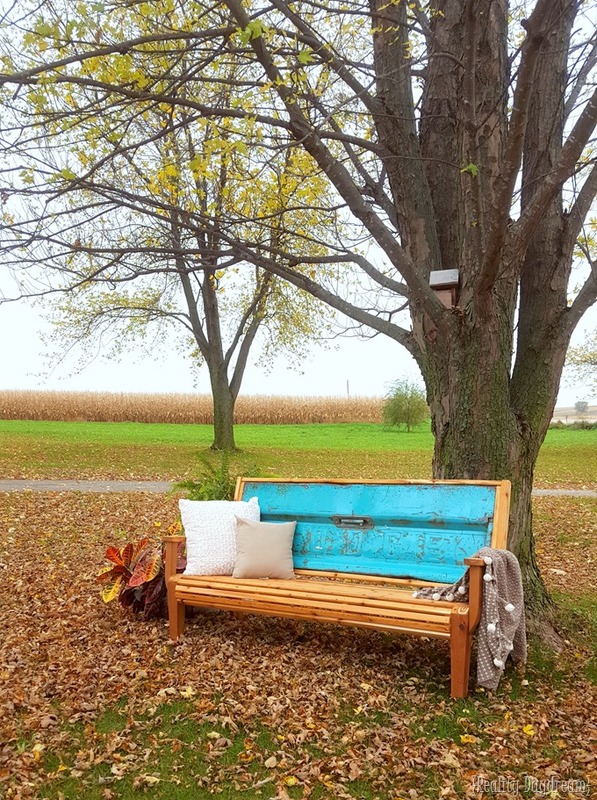 She stumbled upon it last summer and thought it would make a great bench. 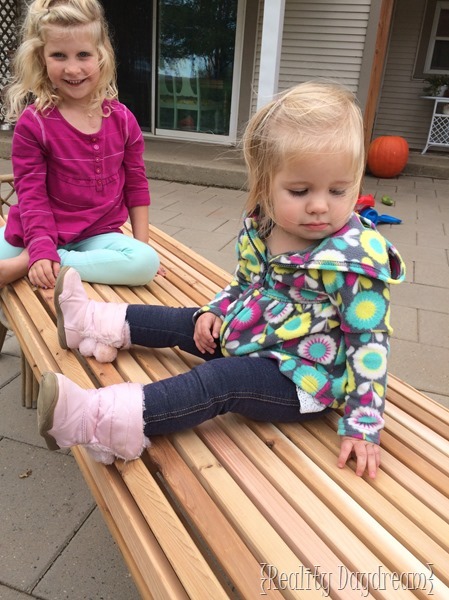 And I said… I can totttttaly make it a bench with my mad skills. So then it sat propped up against the side of the garage for months. 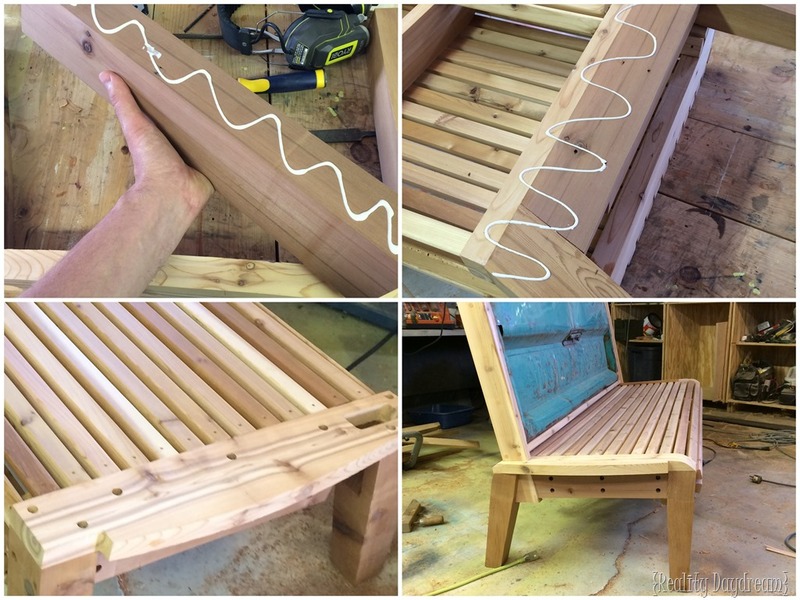 I told Nick of my plans to build a simple bench, and how I wasn’t planning to blog about it. 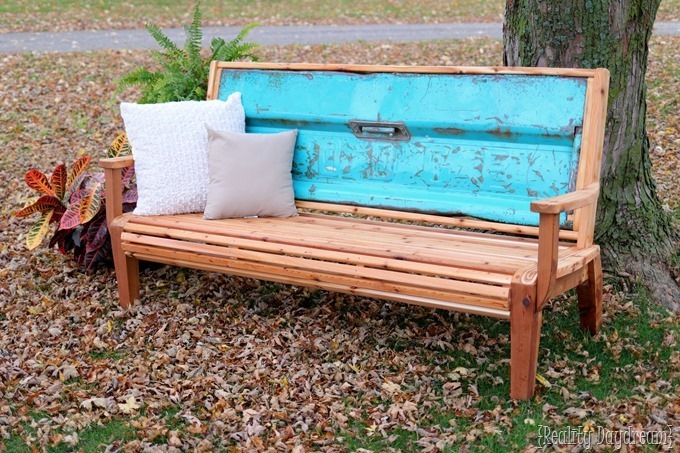 because there are lots of tailgate bench builds out there in blogland. 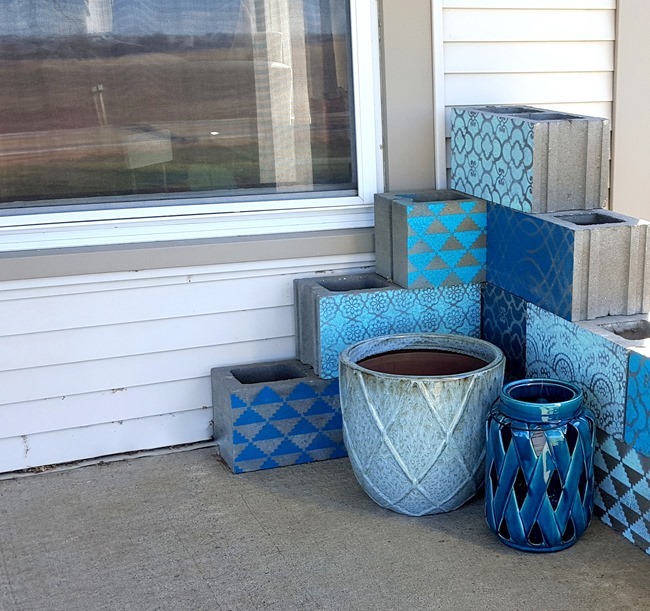 I didn’t want to write a competing post to one of my buildy blogger friends! I think Nick took that as a challenge to make a unique design. It may not be ‘simple’, but yes it is unique. And beautiful. 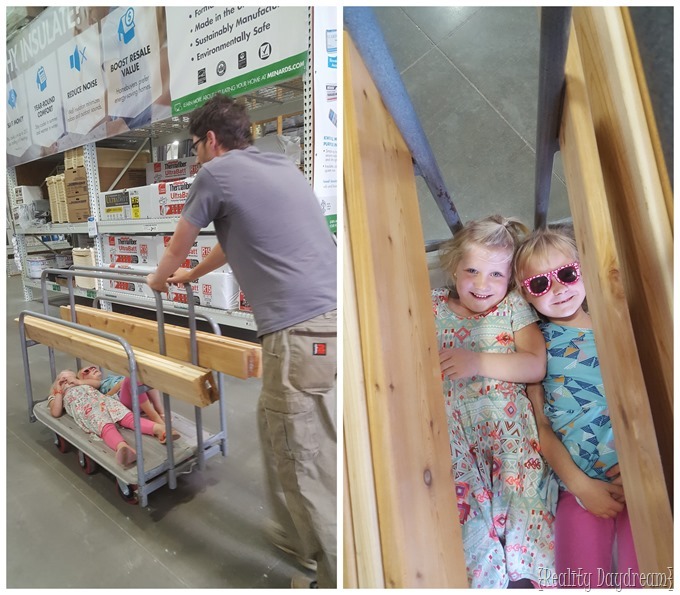 As with all building projects, we started out at the home improvement store to gather supplies and a lottttt of cedar. This trip was not without tomfoolery. Let’s jump right in! Take it away babe! 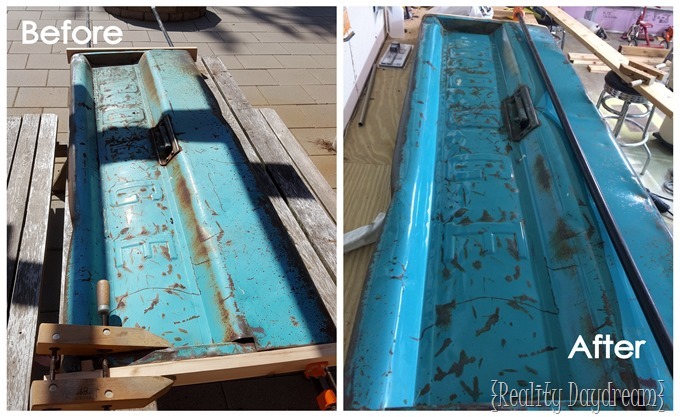 Hi Guys, Nick here… Beth’s Mom brought this old tailgate over earlier this summer. 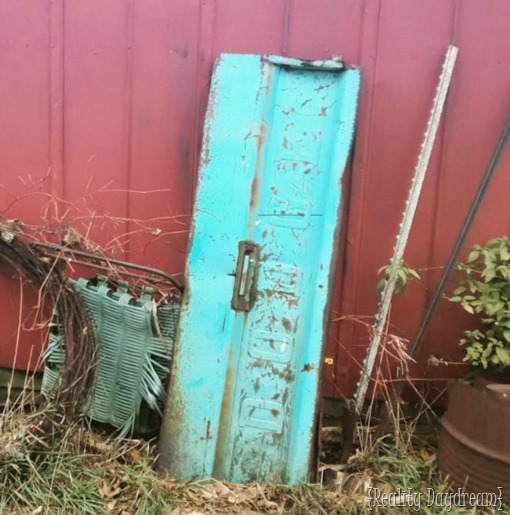 It had sat in front of our garage collecting dust, cob webs and remnant’s of lawn clippings as my lawn mower buzzed past it a hundred times. Let us just say, it needed a lot of TLC. Luckily I am married to wonderful woman that gives me pretty much free reign when it comes to purchasing power tools. So we all loaded up and went to town to purchase a new buffer and buffing compound. And here are the prints for this design. You are welcome! 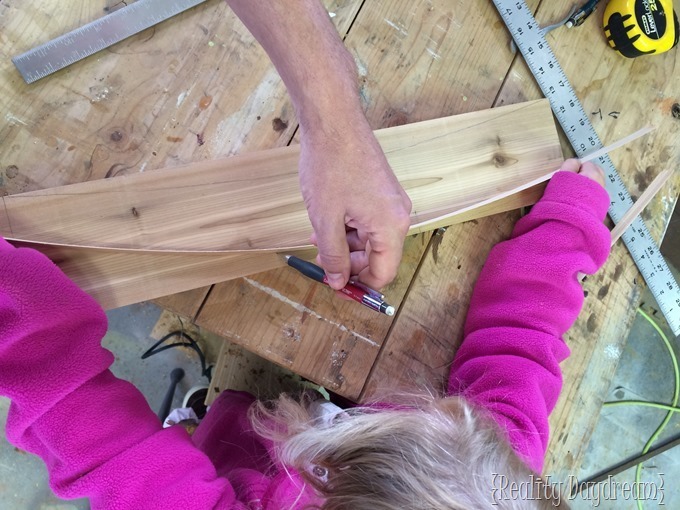 We started by marking and cutting a piece of cedar wood to sit inside the sides of the tailgate. This is how the tailgate will be held into place. It doesn’t have to be pretty, just functional! 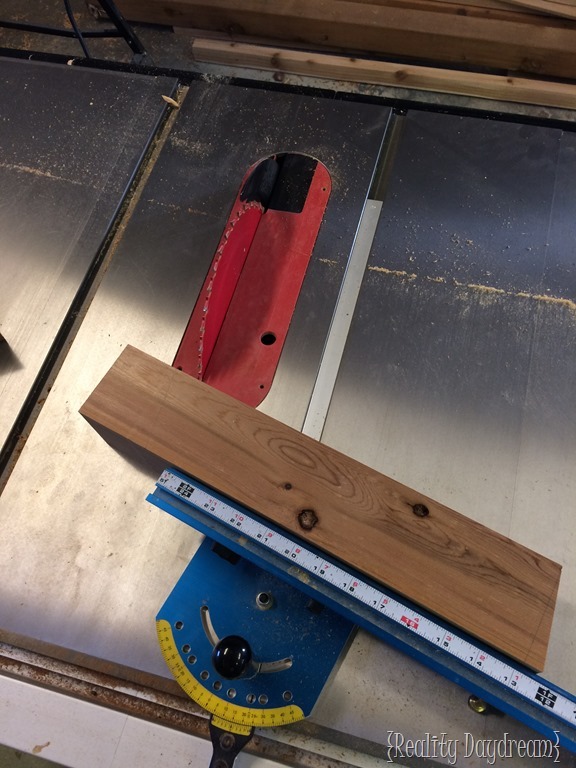 Then we cut a 3/4” spacer that will go on both sides of the tailgate. 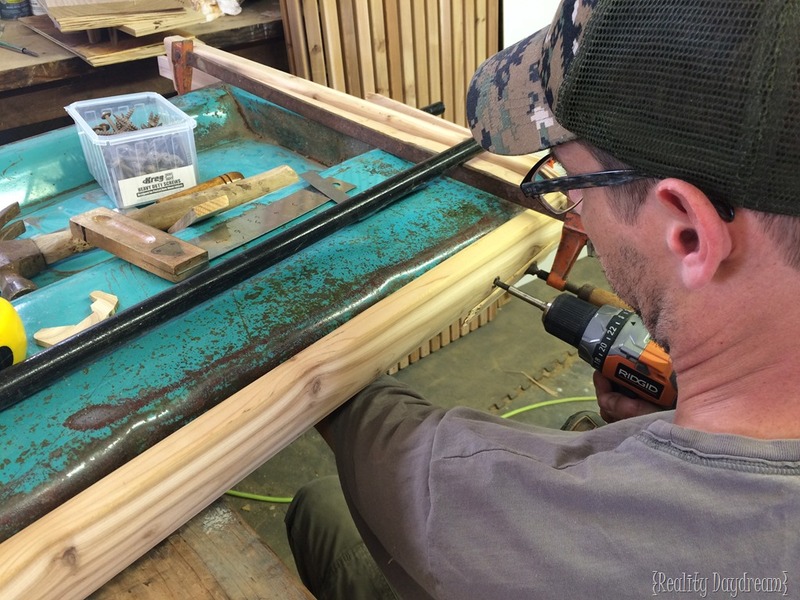 We cut them larger than the tailgate, then glued and screwed them to the tailgate insert. Once that was done we traced around the perimeter of the tailgate and cut the spacer board on a band saw. In other words our 3/4” spacer is the same shape as the tailgate. 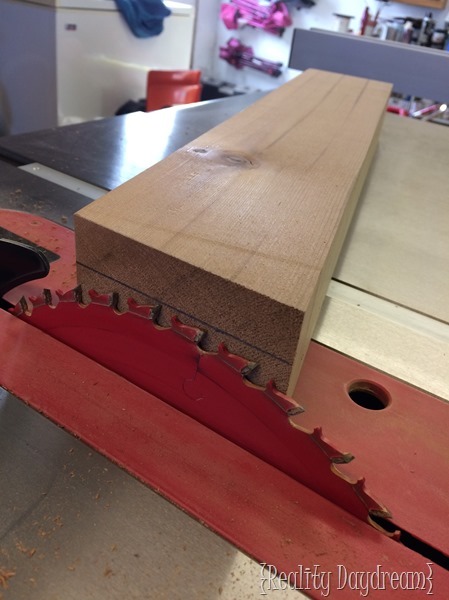 Then we cut the sides, routed the edges with a 1/4” round over bit. Centering the tailgate spacers that we just cut out, glue and screw them together with Kreg HD coated screws. 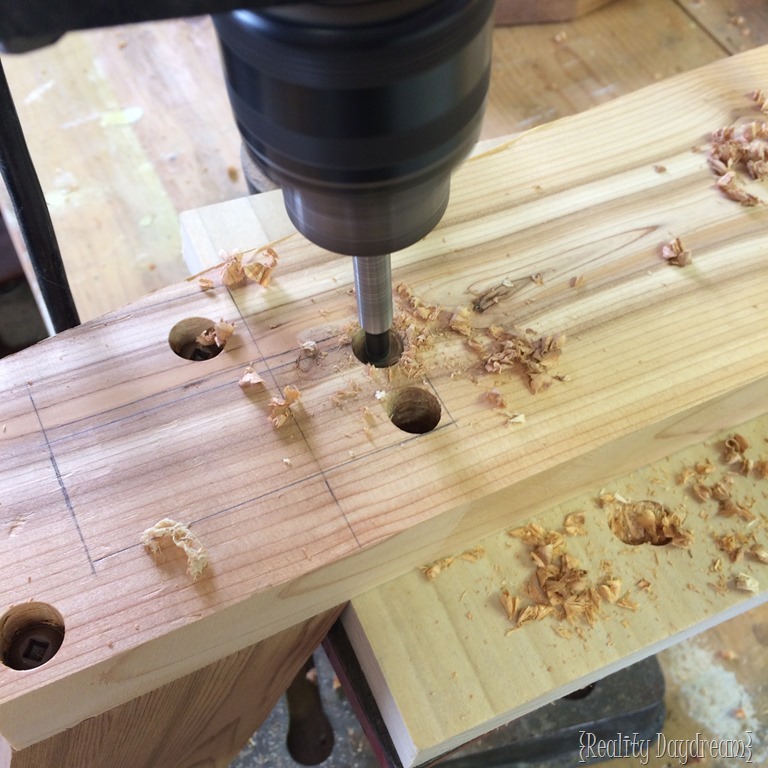 We chose to counter-bore all of our screw holes with a 1/2 inch Forstner bit as well as drilling pilot holes using an 1/8 inch diameter drill bit. Now cut out the tailgate caps. 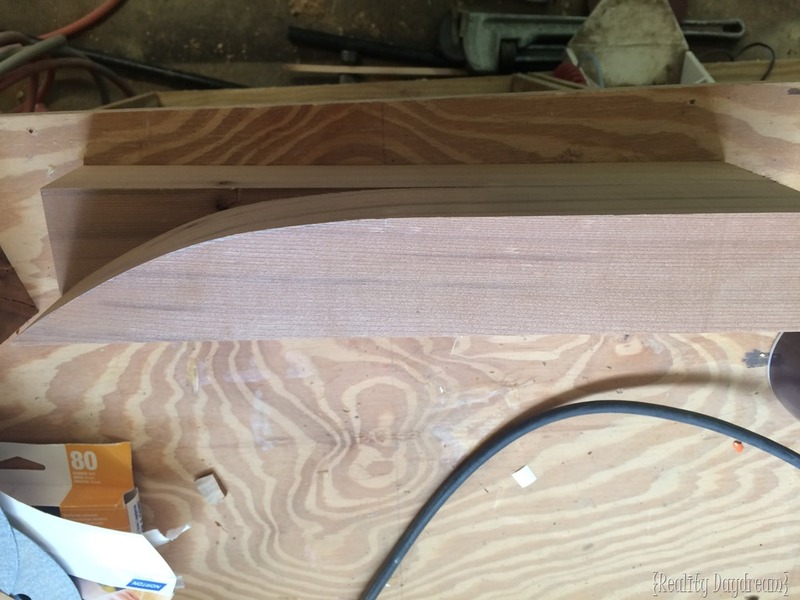 We used the table saw to cut out the inside and the outer curve. 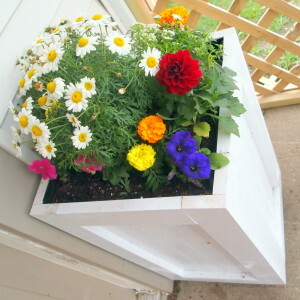 We did this by setting the table saw at 45 degrees and cutting the insides. Then set the blade back to 90 degrees and cut the rest of the inside relief area. 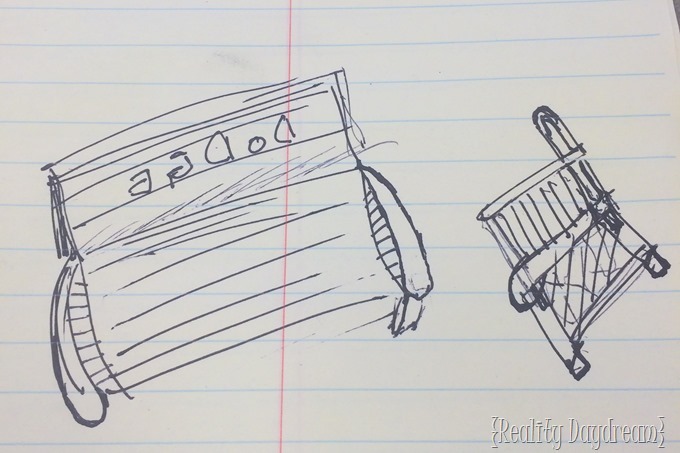 Take several passes to clear out the required material. Next set the blade at an angle that will allow you to cut the majority of our outside radius, it will be something like 10 degrees and again for the edges around 45 degrees. 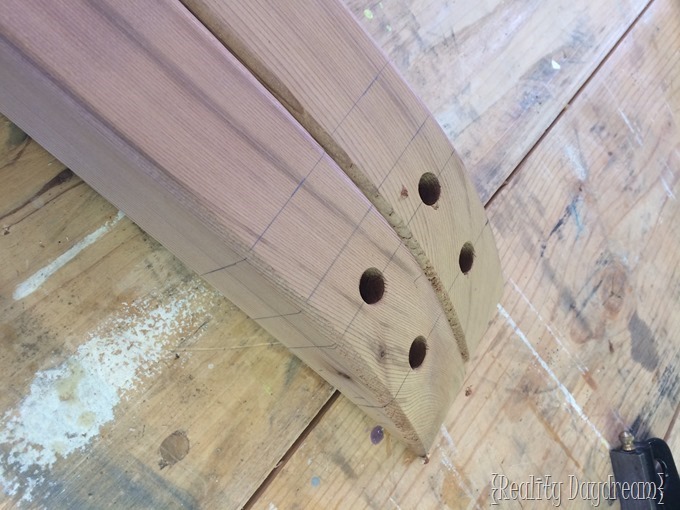 Finally, clean up the inside with a 3/4 dado router bit and sand smooth your outside radius. When you are satisfied with look and fitment of the upper and lower tailgate cap clamp and glue them into place. You might need to cut additional amounts out of the recessed area in the caps to get them to fit well with your tailgate. 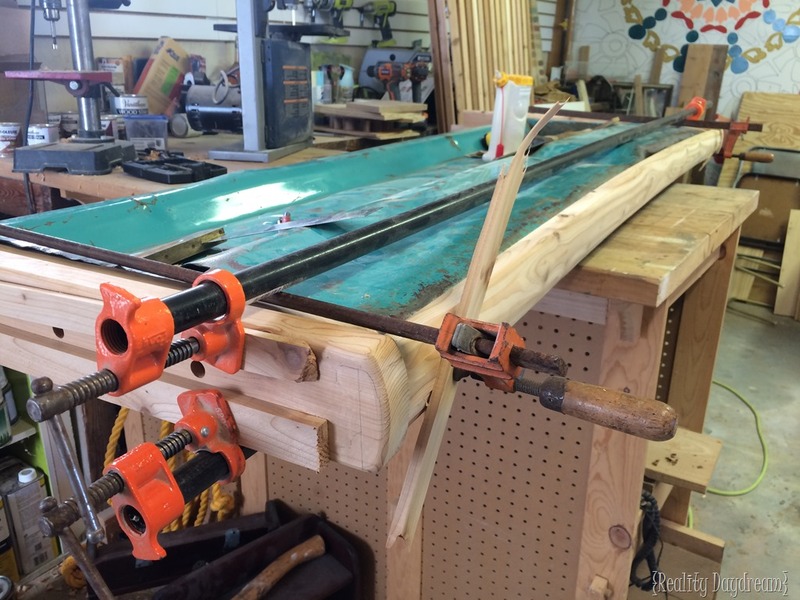 Once everything is clamped into place, use a scrap cut off of the caps to layout their location. Drill a 1/2” counter bore about half way through the tailgate side board, then drill an 1/8” pilot hole and finally secure into location with the Kreg HD Screws. 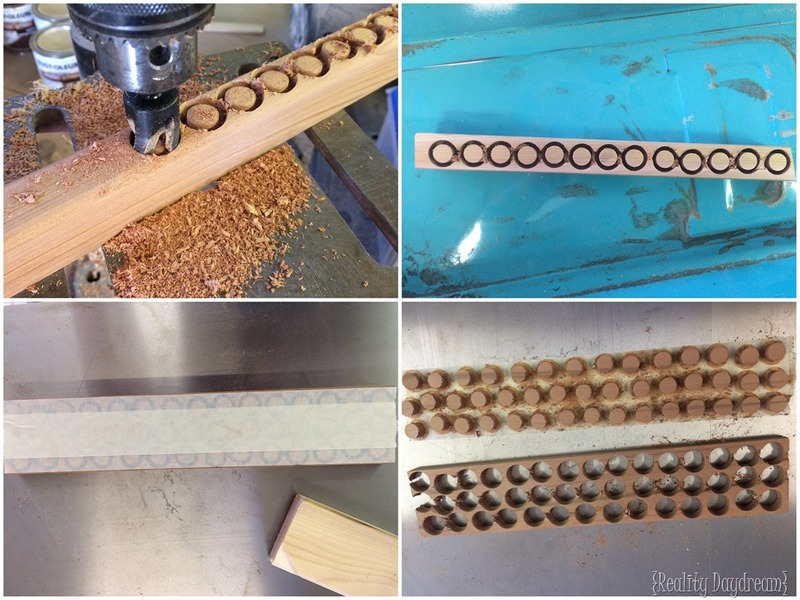 We drilled 13/64” holes and 1/2” counter bores in 3 different location on the top and bottom caps. Then we tapped the tailgate with 1/4-20 tap. and inserted the 1/4-20 screws. We added a dab of blue Loctite to the threads of the 1/4 – 20 screws so that the screw wouldn’t loosen in the future. 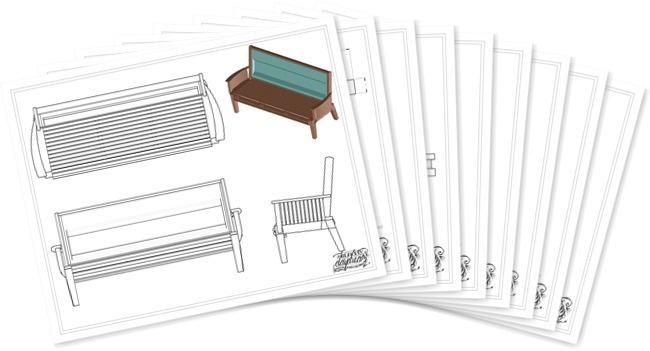 This will complete the back of the bench! 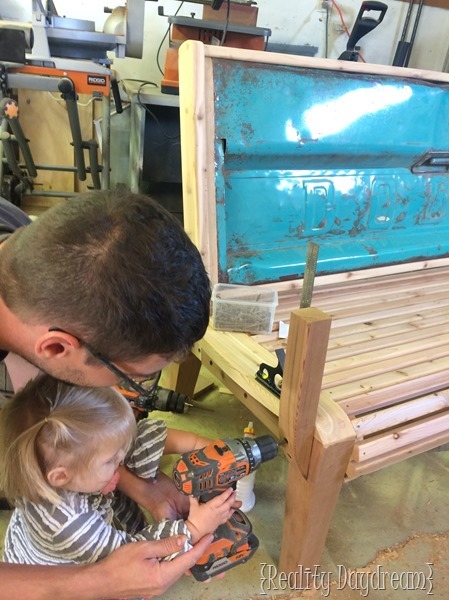 Now lets work on the bench seat. 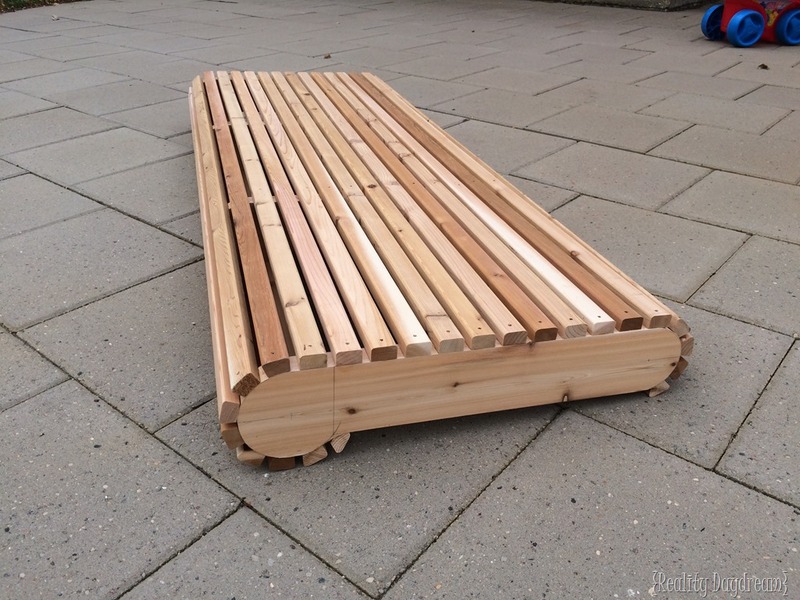 We started by laying out the 4 seat dividers. 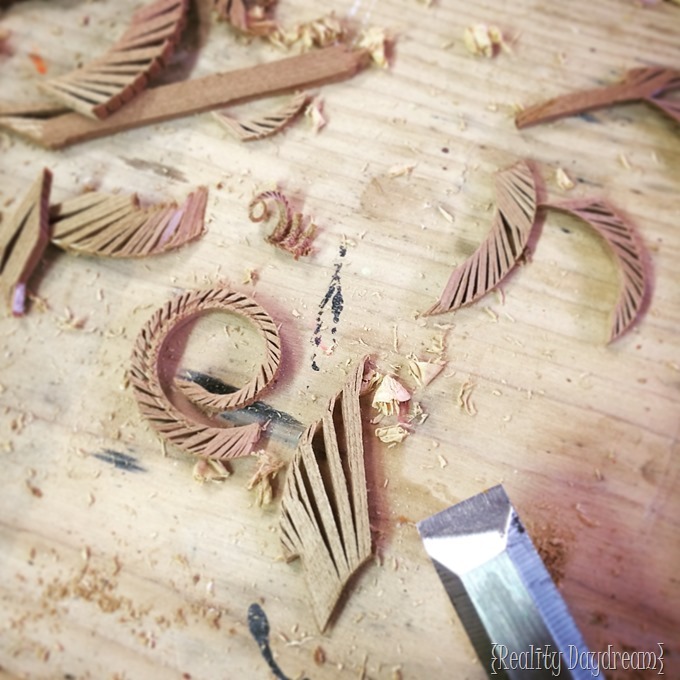 Then cut them out on a band saw and finish them off on a oscillating drum/belt sander. 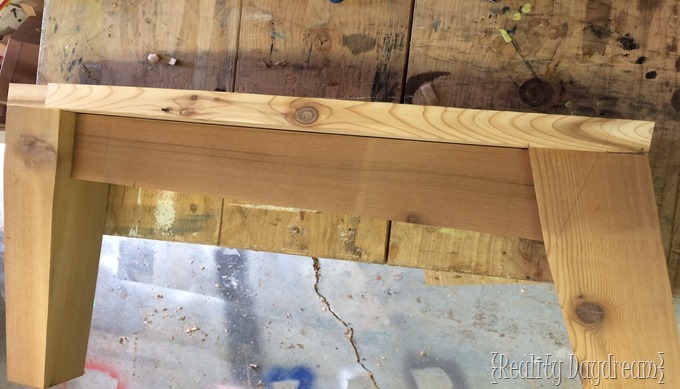 We marked were the first slat would go on each divider. I used the intersection of the front circle and the bottom of the divider. Next we laid out the dividers on our workbench with an appropriate spacing (reference the print). 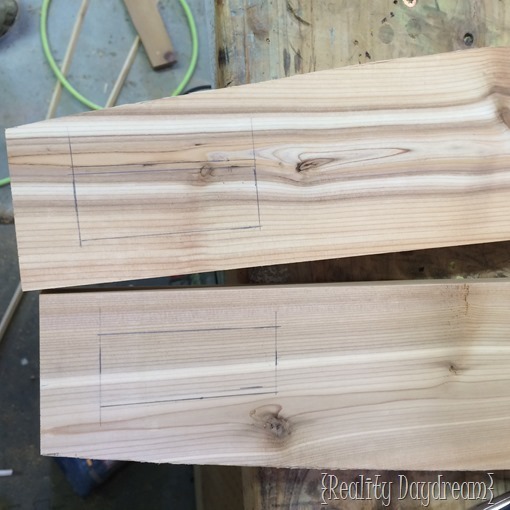 We literally drew out the locations on the workbench with a square then made the front of the dividers flush with the edge of the workbench, and checked measurements both front and back. when we were satisfied we used a little CA glue (superglue) to tack the dividers in place. Then we glued and screwed the first slat. 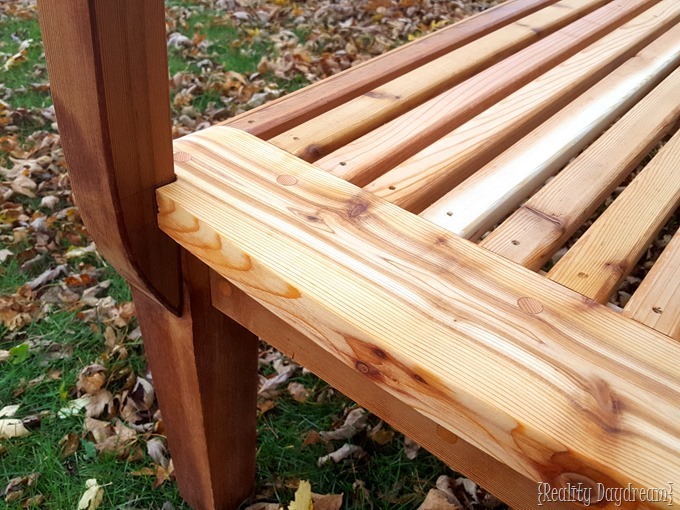 If I was to build another bench like this, I would either use a construction adhesive like liquid nails or nothing, there is enough flex in the slats that most of the glue joints will pop loose. it isn’t a big deal, just kind of pointless. 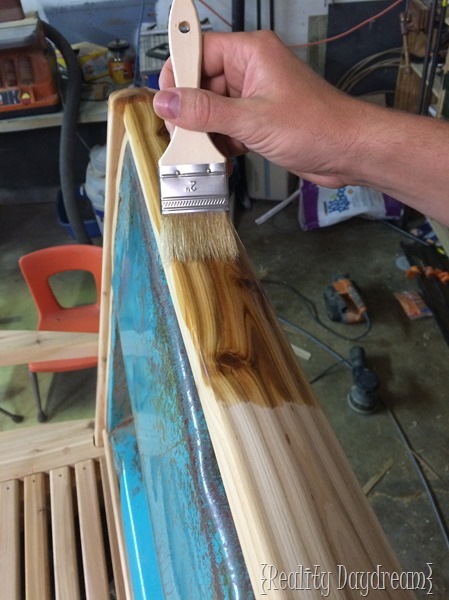 One benefit to not gluing them would be if you ever had to replace a slat, it would make it that much easier. The screws we used were coated #7 x 1 5/8 (T10 Torque head). 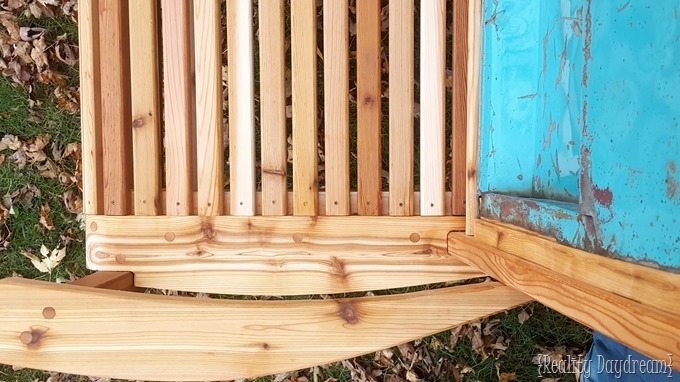 The slats that went around the front and back radius. 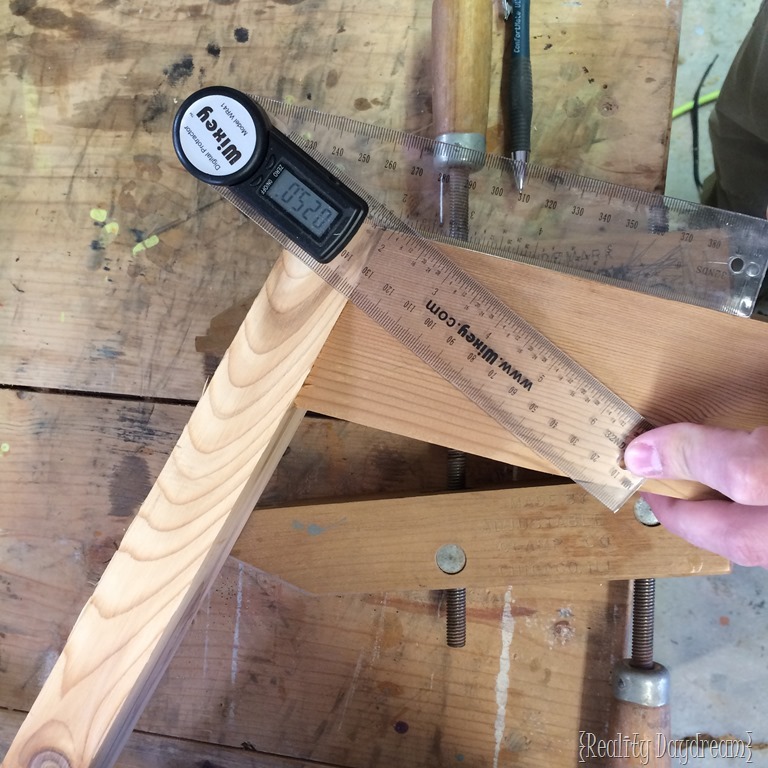 Using a Wixey digital angle gauge (super handy tool) I set and cut the slats on the table saw with a 10 degree angle with the narrow end being at the bottom. 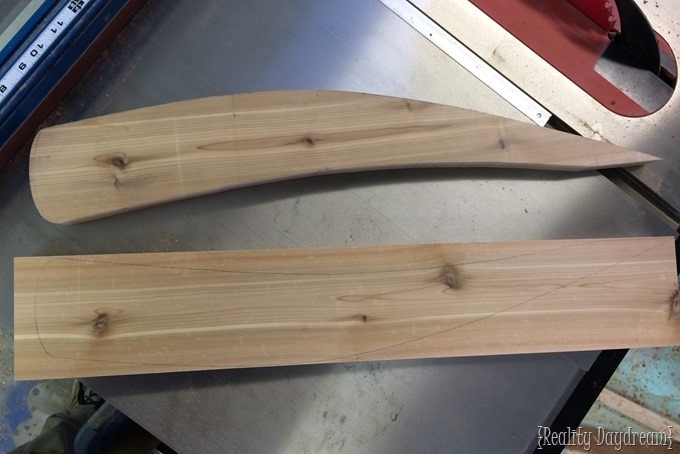 This gives the bench a more uniform look as it goes around the radius. Now keep at it. Once your finished go ahead, take it outside, relax, crack open a ice cold ‘ahhh’ lemonade. Alright, Who’s ready to get thing standing on its own 4 legs?! Layout the 4 legs and cut the correct angles according to the blueprints. 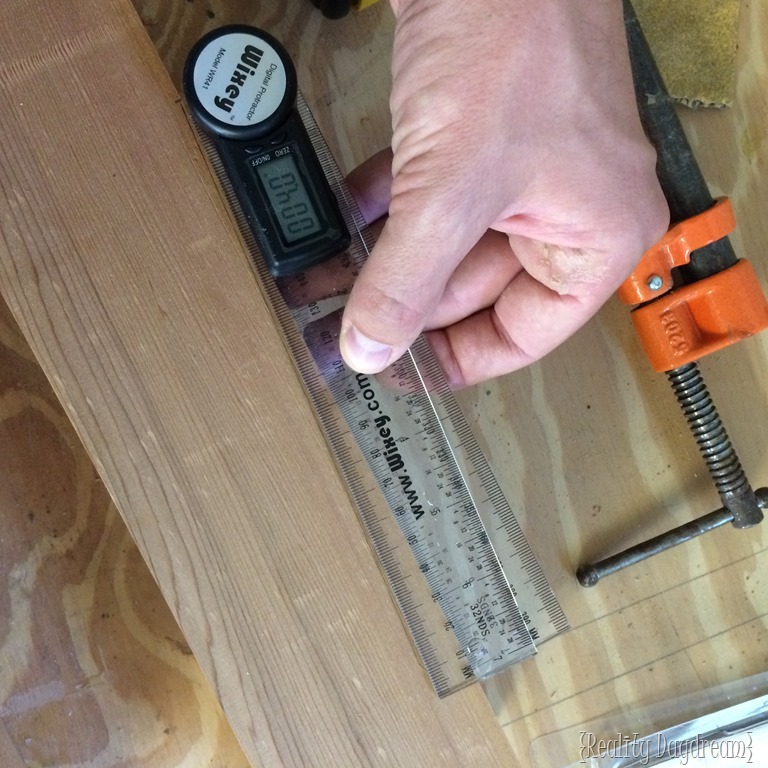 We use a Kreg Precision Miter Gauge. 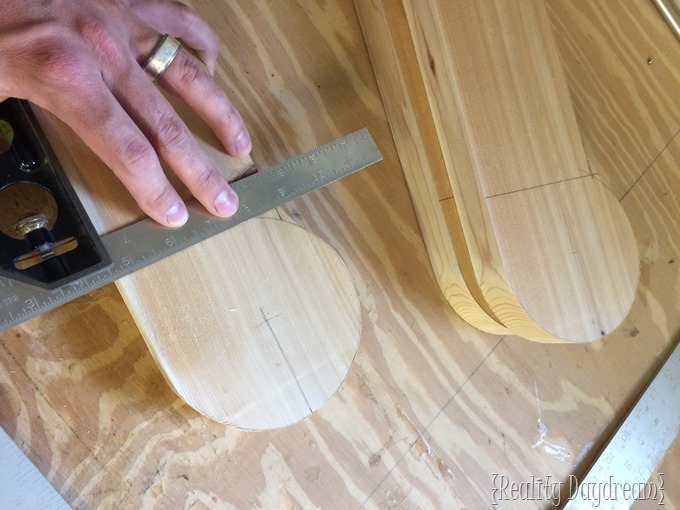 Now, layout the 4 degree taper on the legs. Be sure to make a left and right front and back leg. 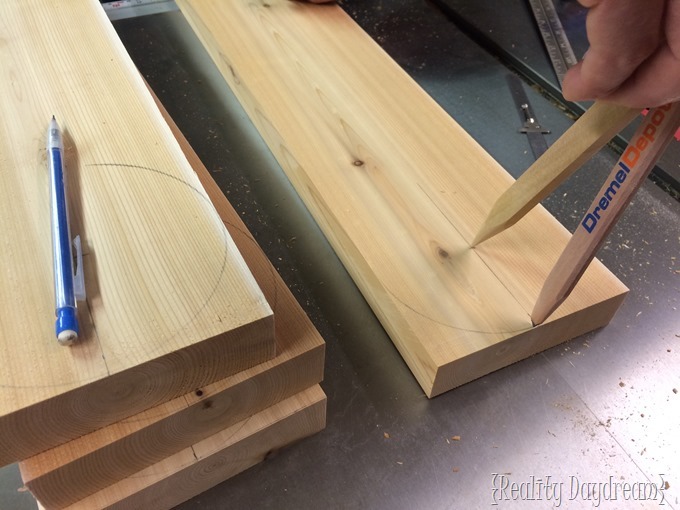 It helps to set the legs into position and mark an X on the sides that need to be cut. We used a Wixey Digital Protractor, another must have for making layout easy. 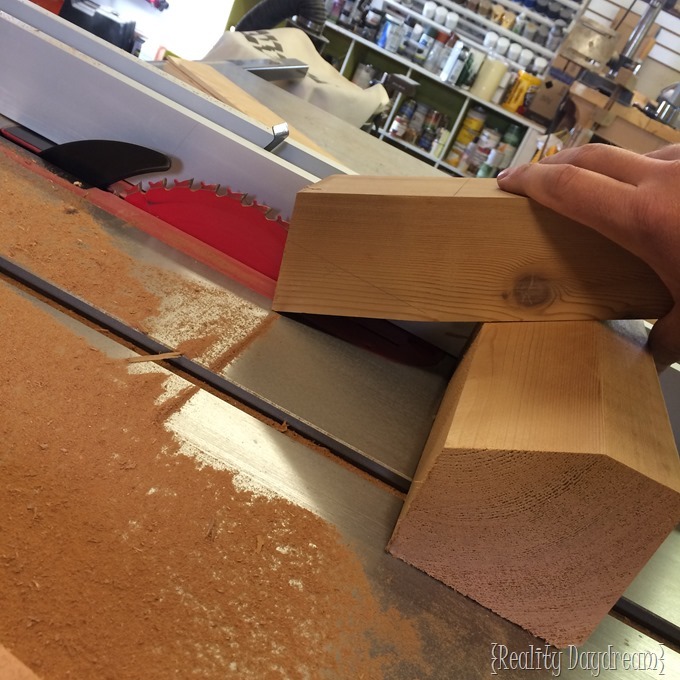 Then cut the 4 degree tapers on the band saw and clean up any saw marks on the belt sander. 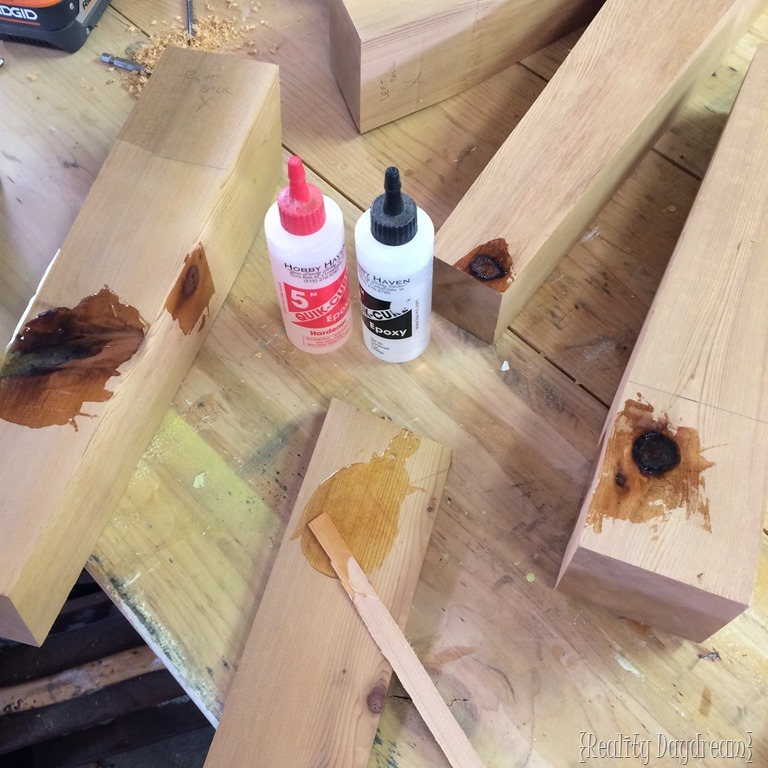 Once all the legs are cut I filled any knots with a 5 minute epoxy. This should help keep them from rotting and increase the longevity of the bench. While the epoxy is drying cut out the bench sides. 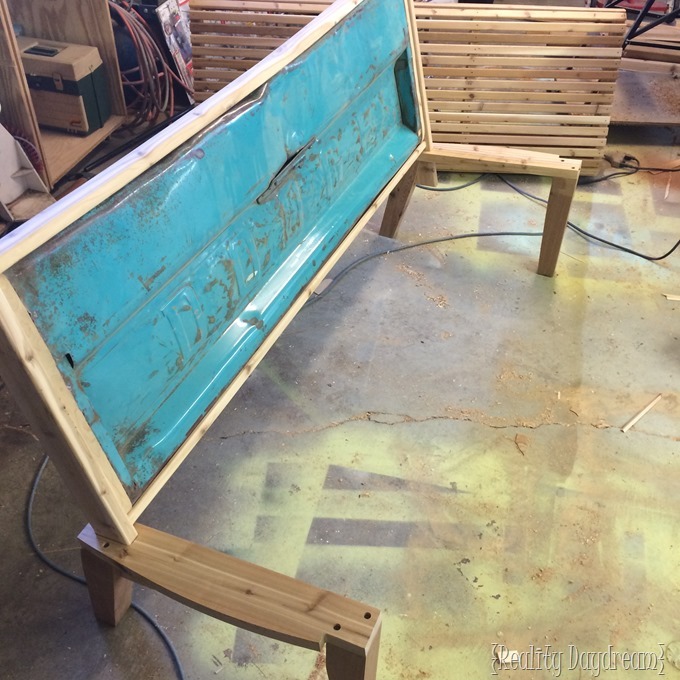 Lay out the opening for the sides of the tailgate back to come through. 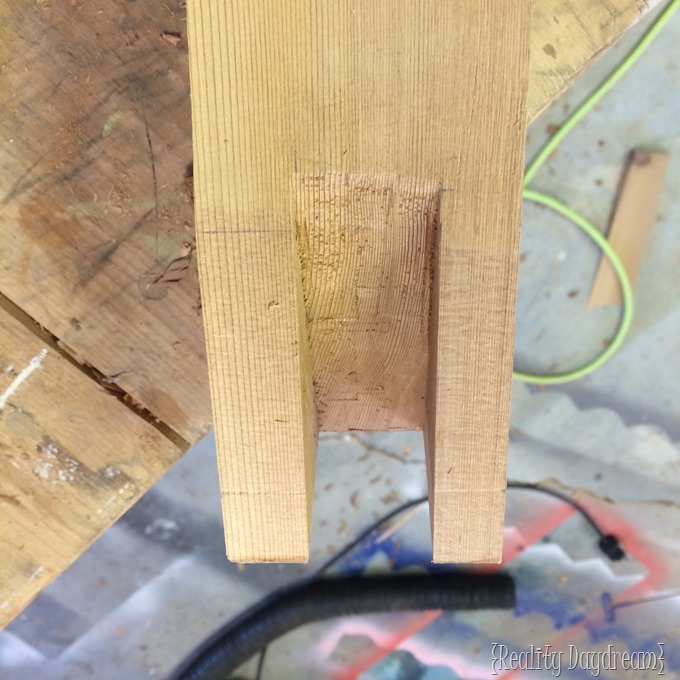 Clamp the rear leg to the Bench sides and transfer the marks to the rear legs. We had glued and screwed ours before I realized that I wasn’t going to be able to complete it as one piece. Don’t be like me. Haha. 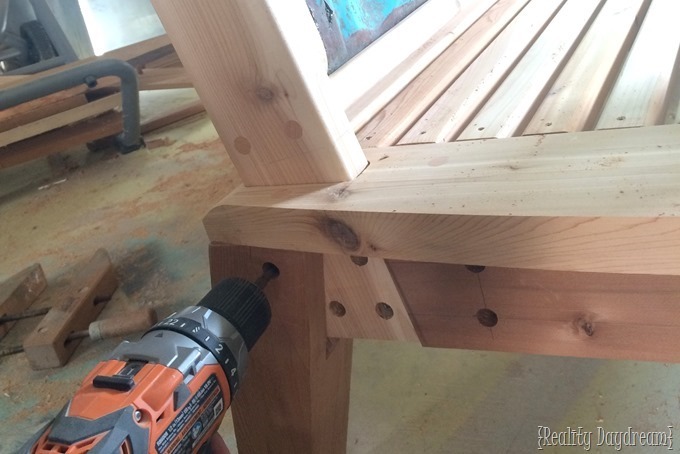 We drill out the opening on the bench sides with the drill press. Set the table at the correct angle. 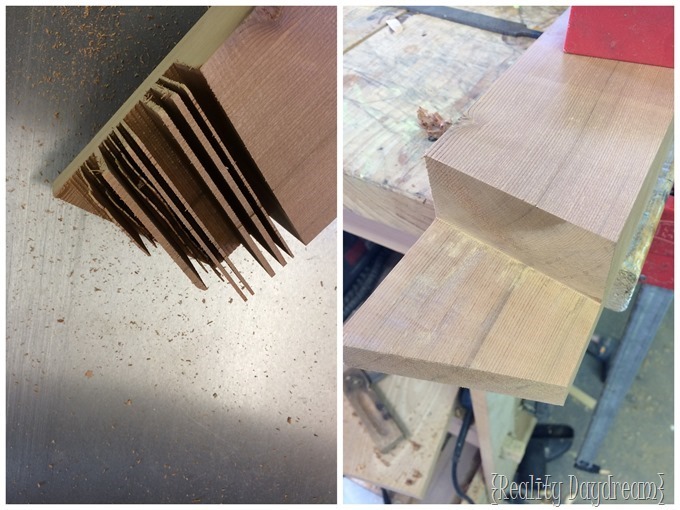 Using a 1/2” forstner bit for the corners and then an 1 1/4” forstner bit to clear out the rest of the material. 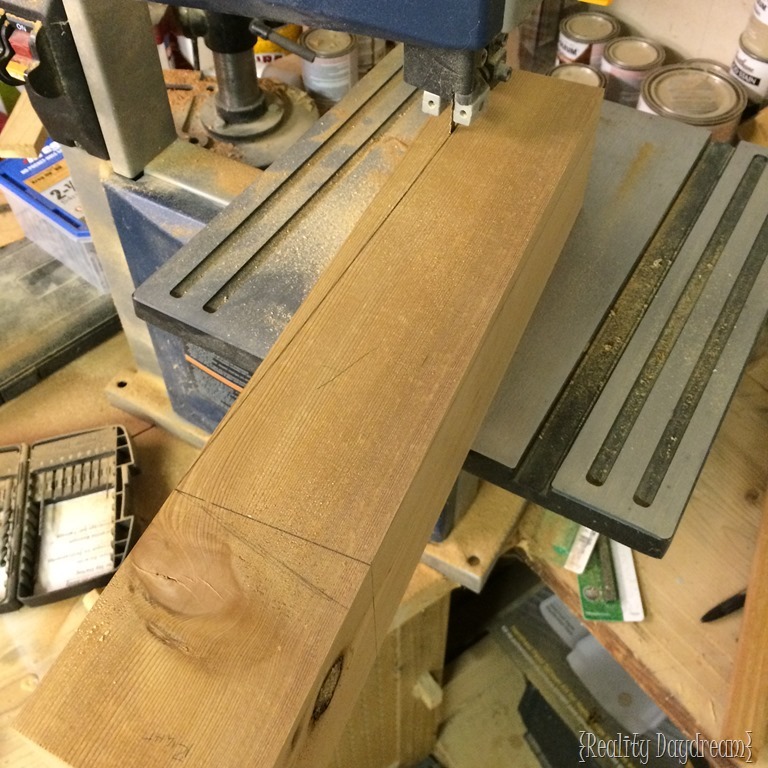 The rear leg openings get cut out on the table saw. The best way to do this would be to use a tenoning jig, but we didn’t have one, so I used a scrap 4X4 that I cut a 29 degree angle in. If I was going to do this again, I would have bought the jig. There are just so many variables that go into cutting this angle. If you decide to use the 4X4 method, please do me a favor and make sure to know where the blade is at all time in relationship to your fingers. We stress safety here and don’t want to see anyone lose a finger. Be safe people. 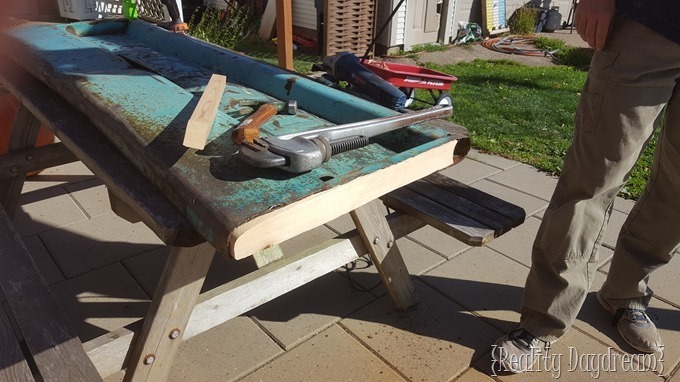 Clear out any remaining pieces and clean up both the bench sides and rear legs with a chisel, rasp, and file. Now glue and screw the legs to the bench sides. 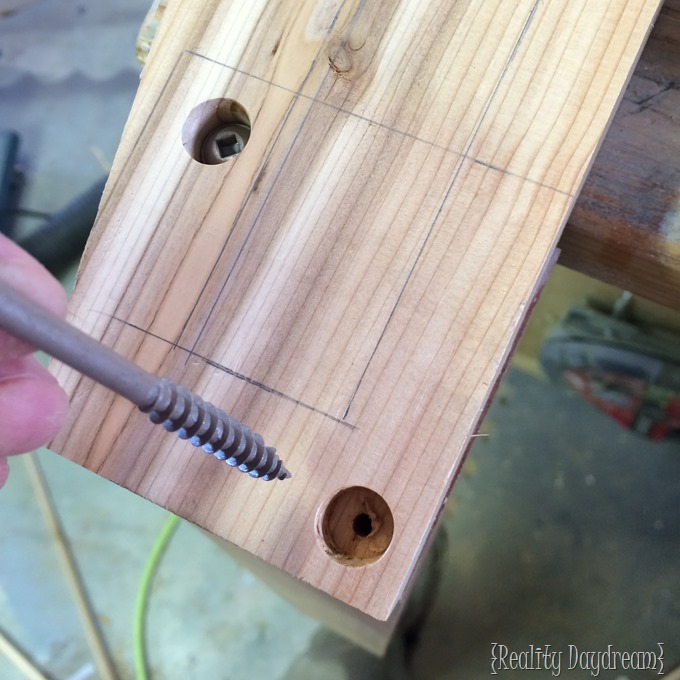 We counter-bore’d and pilot drilled all of the screw holes so that we can plug them later. Test the fit on the tailgate sides. 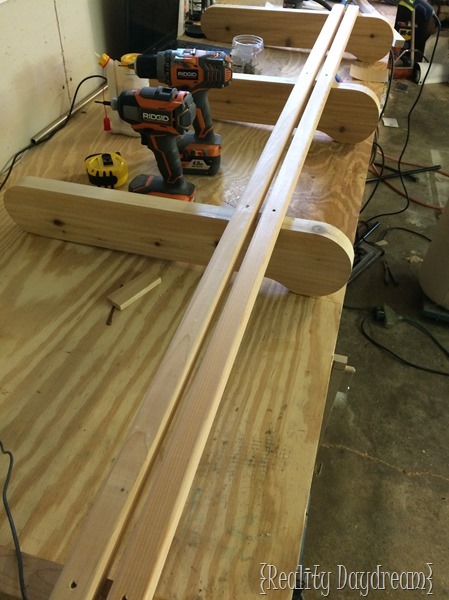 Cut out the side supports. Cut the angle to the front leg first and then use the back leg to mark the location of rear leg angle. Cut and test fit. 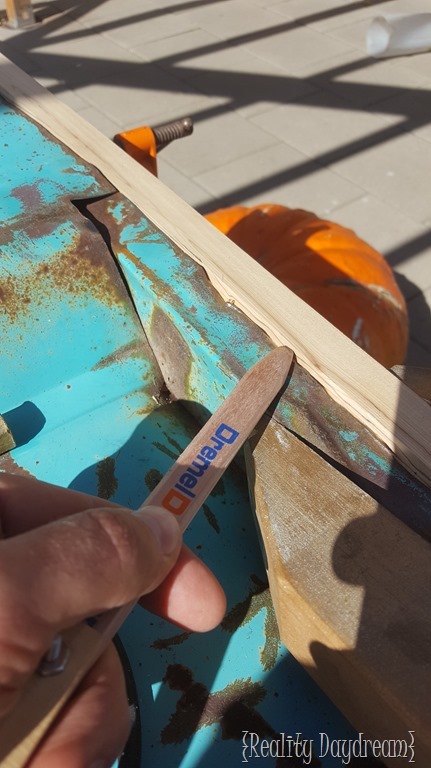 Layout the location for the tailgate side and cut to required depth on the table saw with the Kreg precision Miter gauge. 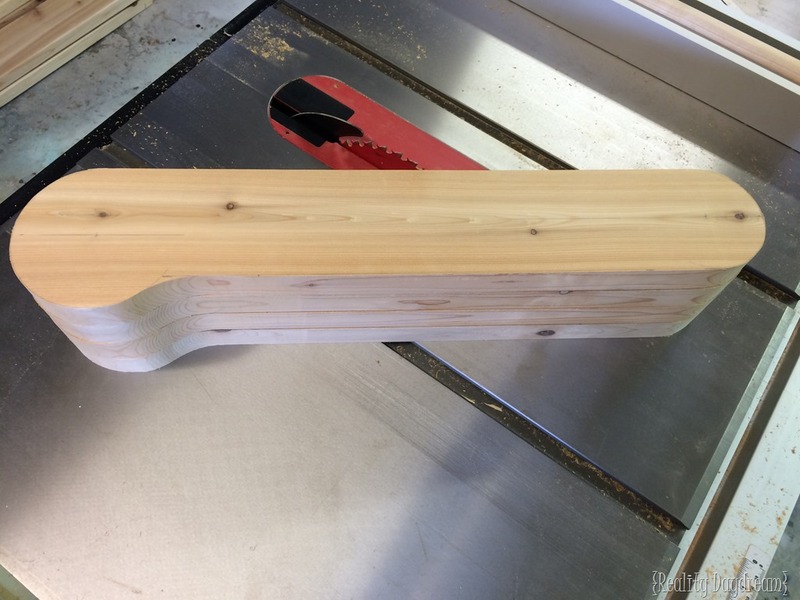 Again clear out any remaining chunks of wood with a chisel, rasp and file. Counter bore (3 places) the bench sides to attach the side supports, it is also helpful to counter bore (6 places) the side supports at this time. Then glue, clamp, pilot drill, and screw the sides to the side supports and finally glue, clamp, pilot drill and screw the sides to the bench. Lets get some plugs in before putting the back on. 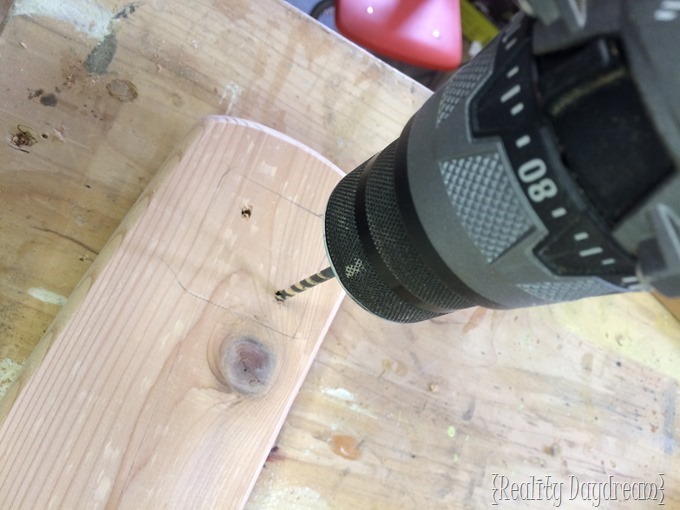 Using a scrap piece to cedar drill the plugs on the drill press, we are using a Rockler 1/2” plug cutter. Then skim-cut the plugs on the table saw to clean them up, cover the plugs with masking tape and cut them at their depth on the table saw. Now that you have these wonderful plugs, fill the holes with wood glue and start plugging. Once they are dry sand them smooth. Get someone to help you put on the back. 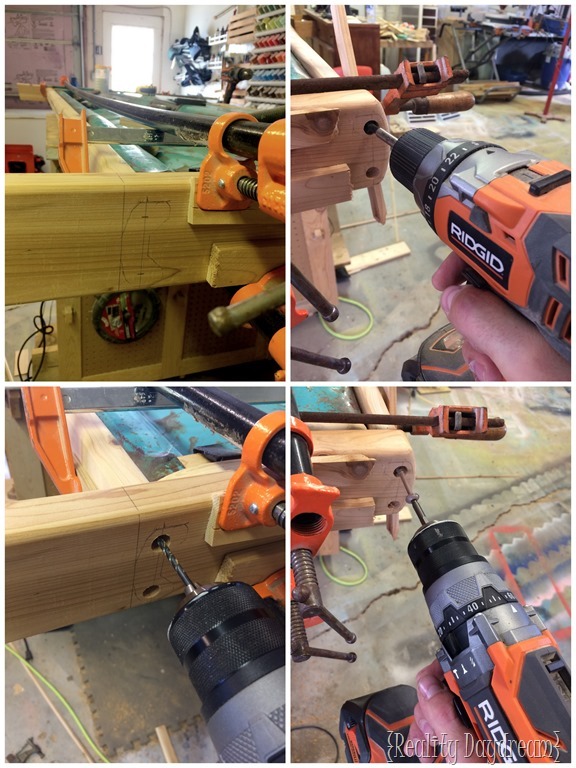 Once the tailgate sides are flush with the bottom of the bench side supports drill and secure them into location. Now layout the arms! Mom was gone for the day, so I found some helpers to help me mark the arc’s. Cut them out and sand them to the finished shape, I ended up rounding the front of the arm a little. 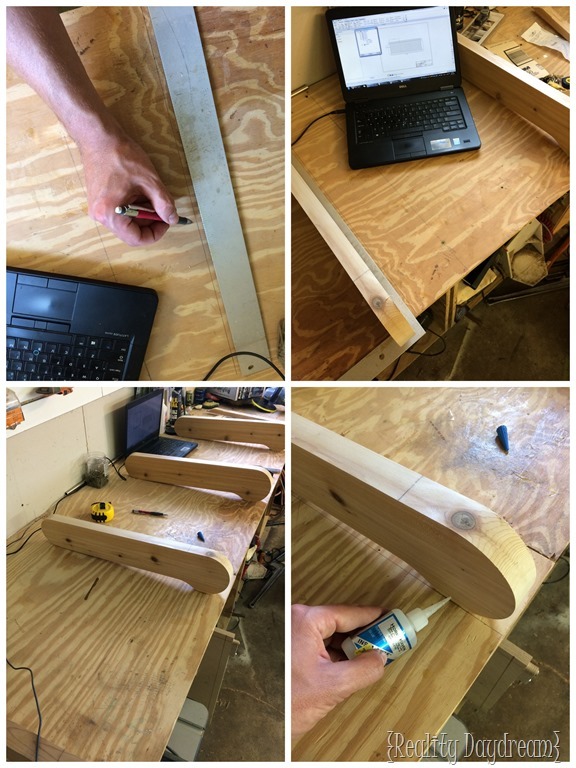 While you are at it layout and cut the arm supports. When you are satisfied round the edges on a router with a 1/4 round over bit. 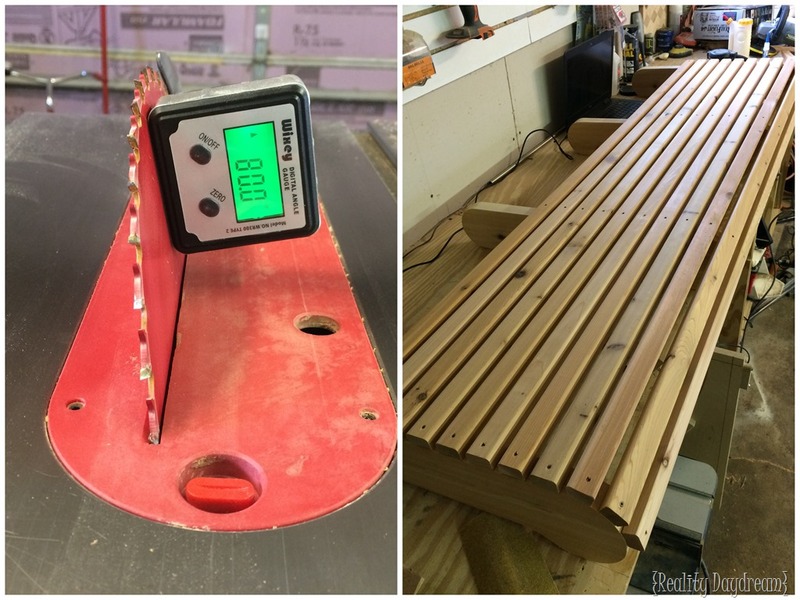 Mark the height required from the bench seat to the bench arm onto the bench arm supports. 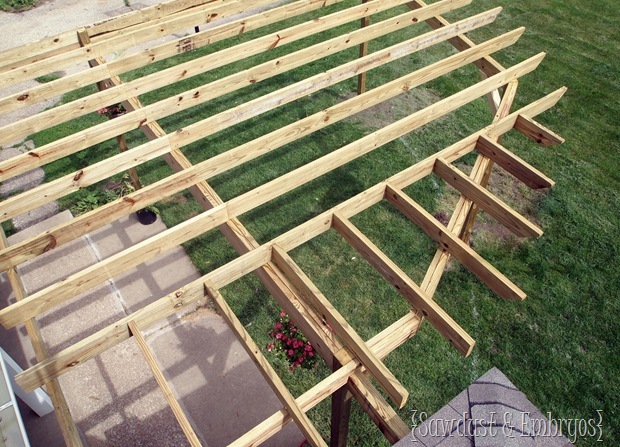 This will help with installation and give you an idea where you will need to have your screws. Using the drill press counter bore the holes for the arm supports. 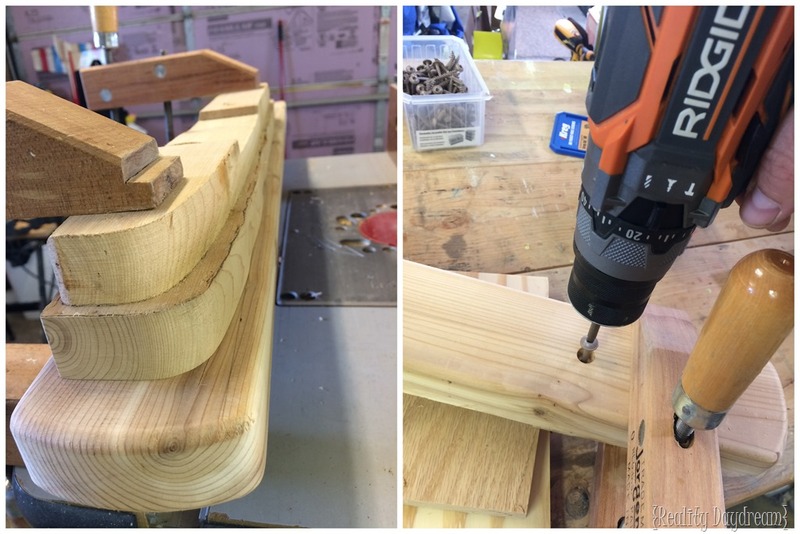 Test fit, when satisfied, glue and screw the support to the bench, checking that they are square to the seat. Place the arms in their appropriate location. I found that I needed to sand the angle where the arm meets the back a little to get it to rest on the arm supports where I wanted. When you are happy with fitment take a pencil and mark where the arms rest on the supports and where they meet the back. I then pilot drilled the arms before counterboring using the traced location. This gave me a better idea of where I would need to counter bore. 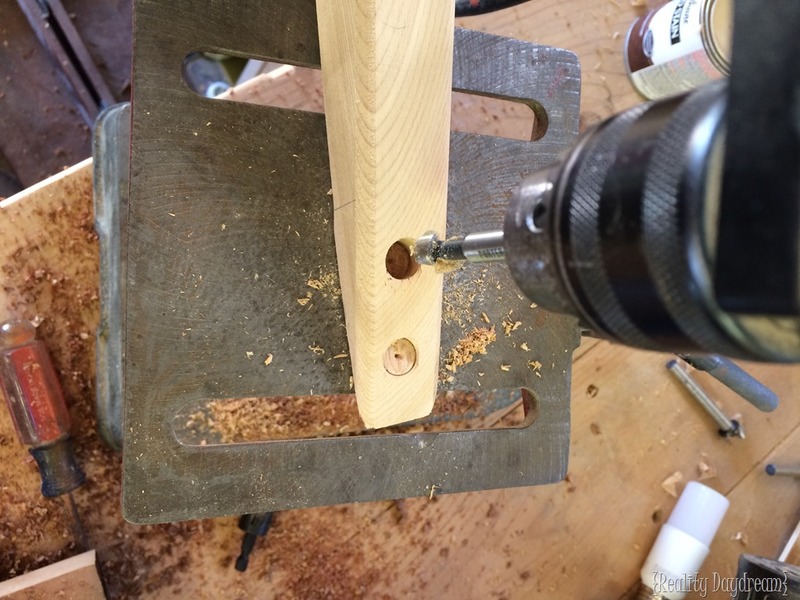 Use the drill press to counter bore the arms we left one screw exposed. so just create a flat for the back screw. Now glue and attach the arms to the arm supports and tailgate back. Then plug everything, sand and finish. 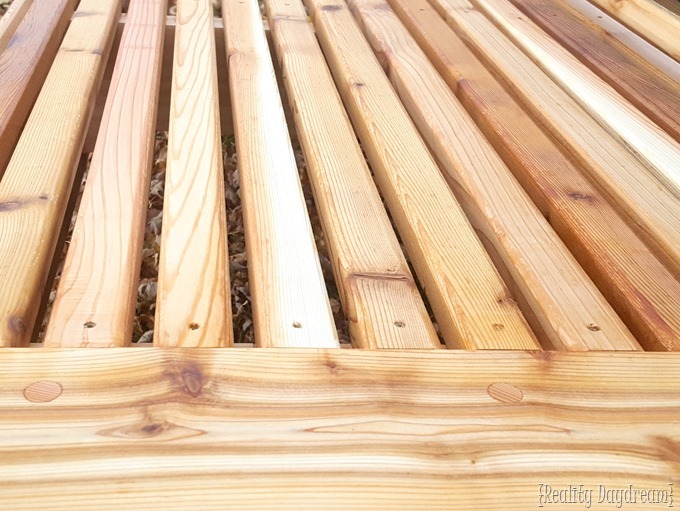 We used boiled linseed oil, thinned down with two parts mineral spirits to one part boiled linseed oil. Slapping on that Linseed Oil was so gratifying. 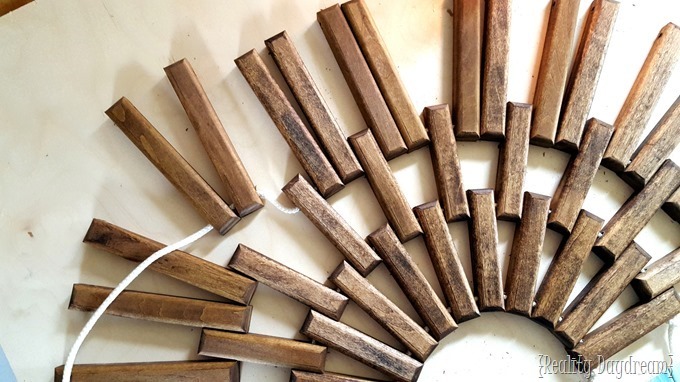 We looove seeing that crazy woodgrain come to life. Especially when we know we’re about to wrap up a project! 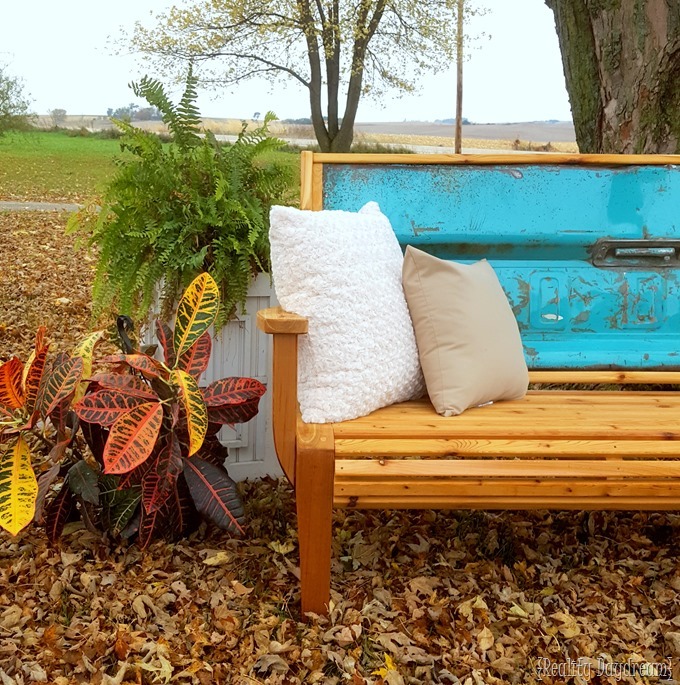 While I wouldn’t describe this Tailgate Bench as ‘simple’ (I would definitely say it’s for advanced woodworkers) it turned out so amazing! And we love that it’s all in honor of my late Grandpa Oren! This sucker is SOLID. And the details are mesmerizing! 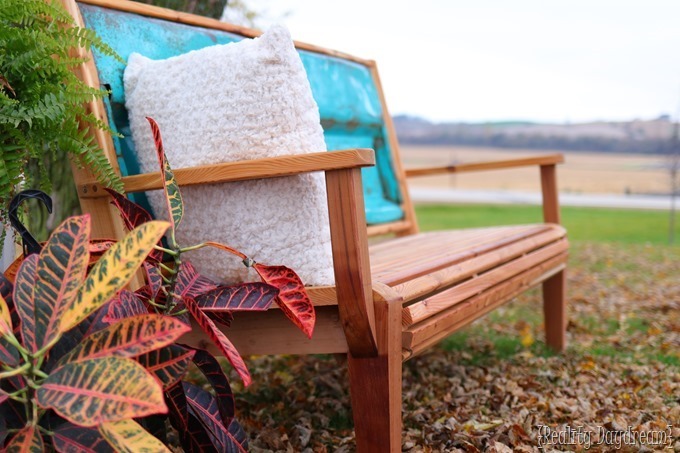 I will say we also had a blast staging and photographing this bad boy on this gorgeous fall day. Although I would have preferred that there would be more leaves still on the trees, but we can’t boss around Mother Nature. Estoy admirando y disfrutando cada uno de sus proyectos, mi enhorabuena por su buen trabajo. 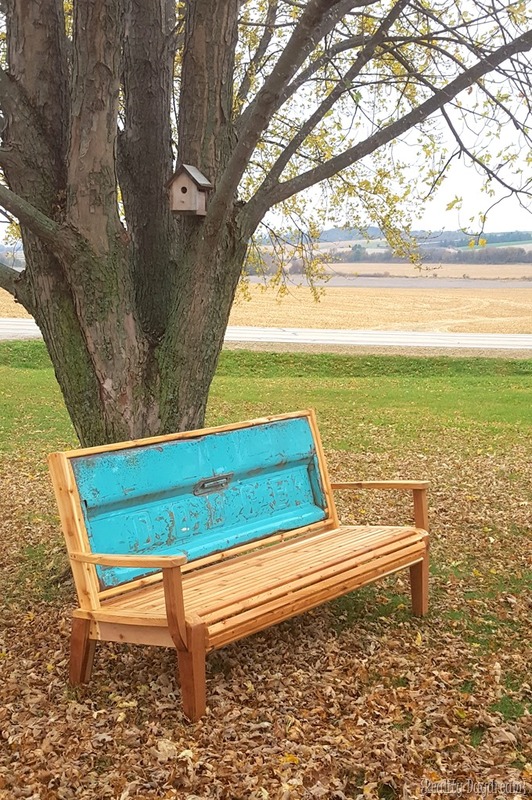 I love your tailgate bench and it’s memorial to grandpa Oren! Good job! WOW Nick, that is just fabulous! Your attention to detail is very evident in this piece.